This was an insanely fast project – even if you don’t think you’re a quick sewer, this is definitely something you can do in an afternoon. There are four pieces (five if you cut the view with the flounce), and it’s very easy to zigzag them all together with your regular old sewing machine. I made it even easier by deciding not to hem the skirt. After it was assembled I just cleaned up up the raw edge and then zigzagged it, but I could have stopped at the clean edge, as jersey doesn’t really fray the way woven fabrics do. Now, the thing with jersey is that typically you need a serger, which is a special type of sewing machine that most hobby home sewers do not own. I don’t have one, and my friend who is a freelance costumer and seamstress doesn’t have one. They’re expensive. Anyway, you can sew jersey with a regular machine, you just need to use some particular techniques. The pattern I used, Kwik Sew 3513, is part of a special line of patterns for serging. It also includes tips and instructions for making this with a regular machine, which made me feel more confident in proceeding. I also really like Kwik Sew patterns as they tend to have well-written directions and straightforward construction techniques. One thing that is a little tricky about this pattern is that it runs big – I didn’t see this until after the fact, but the consensus on PatternReview.com is to go down two sizes. I also think that different brands or types of jersey fabric will behave differently – what I have seems to stay stretched out once I’ve put the skirt on. I started off cutting a large, and by the time I finished sizing it down for the second time, I had cut something that was just about an extra small. I would recommend that you initially cut only the yoke pieces, sew them together, and then try that on to see if you can gauge the fit a bit more precisely. Settle the yoke wherever on your hips or waist you’d like it to land, and then see how it’s fitting. You don’t want to see any gaps at your booty, like with jeans, and you probably will want to make it a shade smaller than you think – remember that it will stretch. Mark the fabric or pin it with safety pins, and then compare what you’ve got to the pattern pieces for the yoke to see what size of skirt panels to cut. It won’t really save you much fabric, but it will save you from having to cut down your pieces, either before or after assembling the skirt. 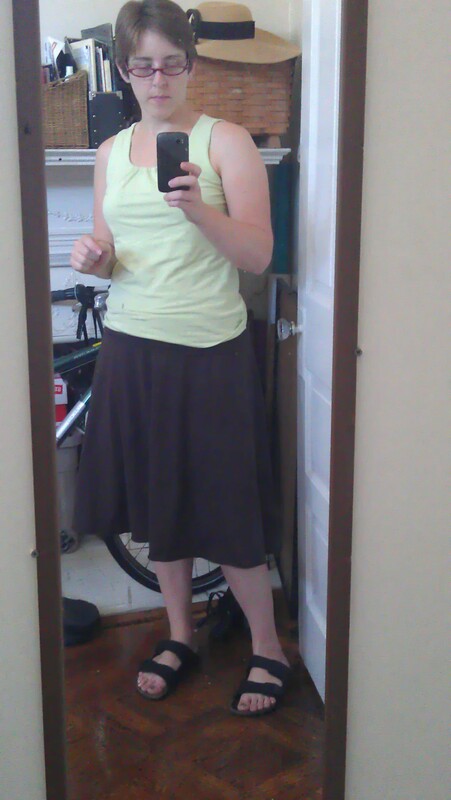 I did try on the yoke in this fashion, but I’d already cut out the skirt pieces. I did cut the yoke down a little bit initially, and I was able to stretch the yoke out while attaching the skirt, so it didn’t matter at first. When I later decided the skirt was still too big, I pinned up the excess at the seam on one side and wore it for another day or so around the house to make sure it seemed OK. I partially detached the yoke from the skirt on the side where I’d pinned it, marked what I wanted to take out, cut out the extra, and sewed the yoke back together. This left quite a bit of extra fabric in the skirt. I could have pulled out the pattern pieces and sized it down on that one side, but instead I took an idea from a very old Gap skirt and made half of a pleat with the excess. I set the skirt fabric against the new yoke, pulling the seam towards the front of the skirt and gathering the excess in front of the seam. I took the excess fabric and folded it back over the side seam and stitched it all in place. I may change my mind and cut it down anyway, but as this is just something to wear around the house and on errands, I’m not feeling too particular about it. Overall I would say this is a great pattern, and I imagine there will be plenty more of these in my future. This is probably also something you could make from some old tee shirts if you’re into upcycling or just need to keep it cheap.